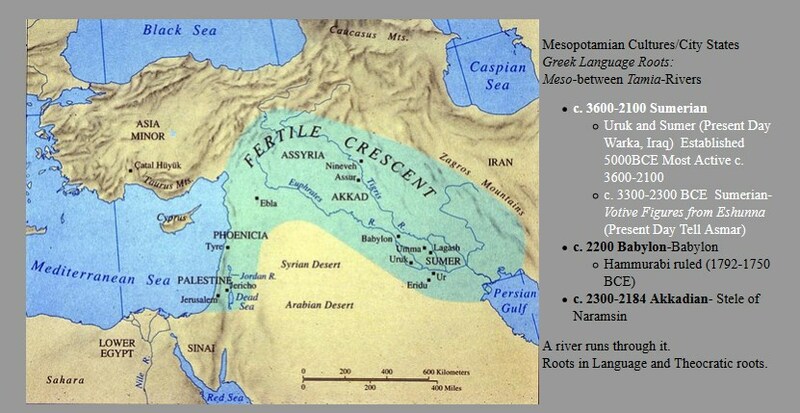 In the region that is known today as Iraq and Iran historians call the Fertile Crescent. It is part of the ancient Near East. 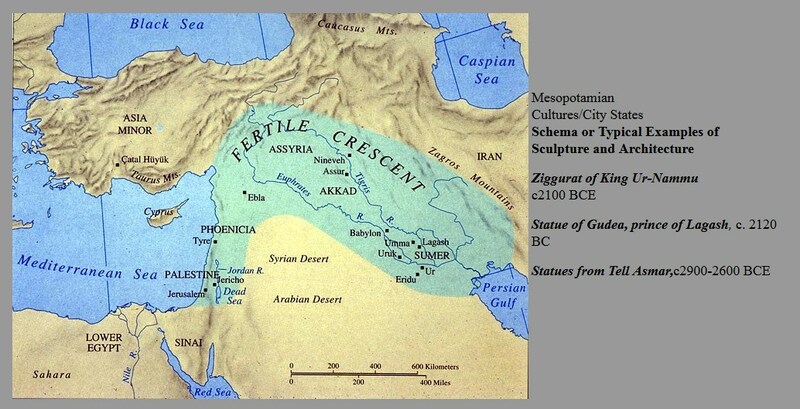 The geography of the Fertile Crescent is very important to the cities that existed there. In essence the major cities located in the Fertile Crescent developed there because of the intersection up two rivers called the Tigris and the Euphrates. Some historians call this place Mesopotamia, which means in ancient Greek between the two rivers. In essence the cities that grew up there had the natural resources of the river or rivers as well as irrigation mud some semi-precious stones reeds and clay as their major resources. They also raise sheep and cattle in this area and they had precious metals. 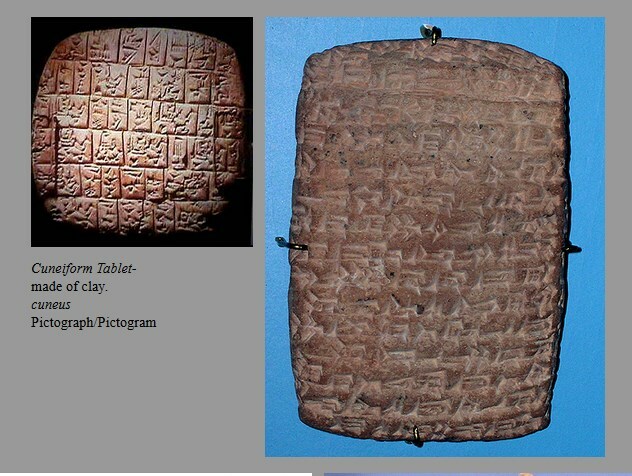 This region which we will now call Mesopotamia is not a prehistoric culture because they had written documents such as these clay tablets that have a former writing on them called cuneiform. 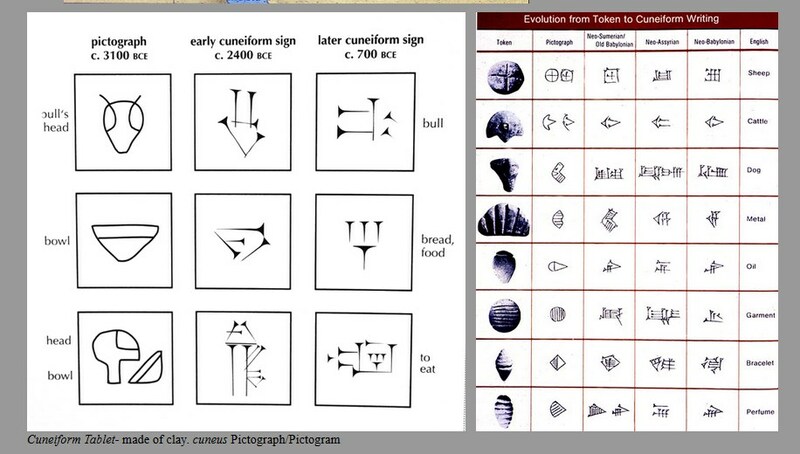 Cuneiform writing is a form of pictographic writing. It is similar to the Egyptian hieroglyphs we will be studying later. If you look at the writing you can see that it developed from simple pictures into abstract kinds of letters that represent concepts. Later on towards the end of the culture these forms also became phonetic sounds. The fact that we have quite a bit of writing from the ancient Near East also gives us a lot of data that we can used to interpret what the art means and also give us a picture of what life was like at that time. We literally have a lot of textual information that aids us in interpreting and reading the works of art we are studying. 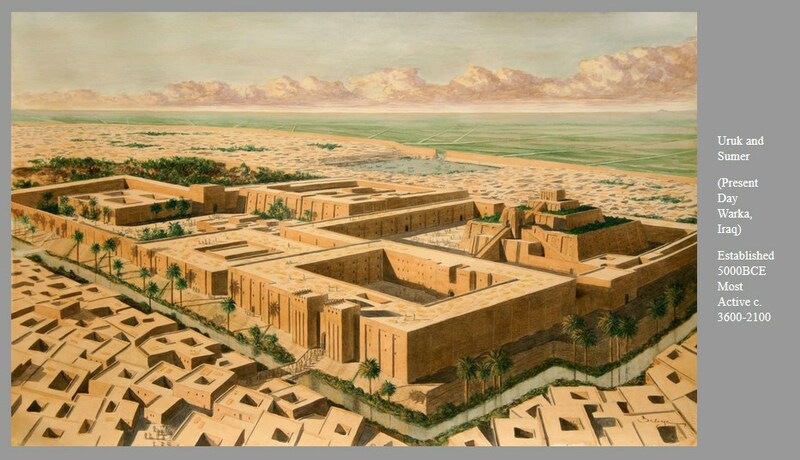 The architecture of the ancient Mesopotamian city is very similar to be ancient architecture of the site we studied on Asia Minor called Catal Huyuk. The cities were constructed of mud brick often coated with plaster located on the banks of rivers where they got the mud from often the mud was laced with reeds or some sort of plant in order to strengthen it. 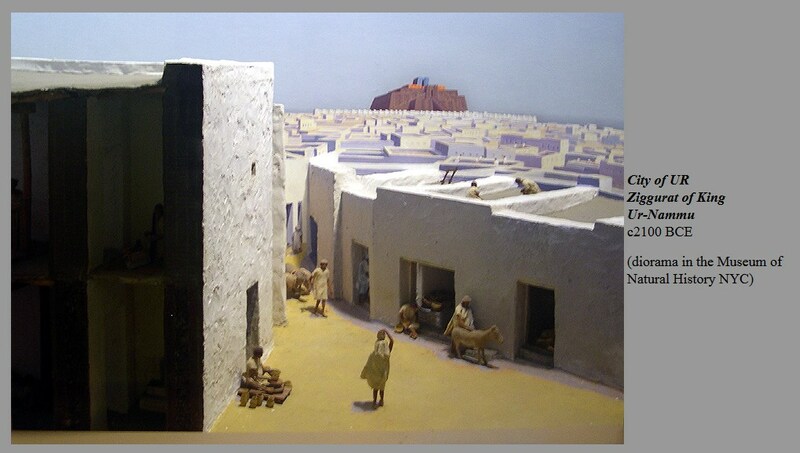 The actual dwellings of the people from the cities were almost exactly like previous Neolithic sites they were entered through the top of the roofs as a form of defense. Often the walls of these dwellings were plastered. We have large archaeological sites and digs in which they've been able to reconstruct what these look like. In some ways these dwellings are very similar to Navajo dwellings in the Americas. 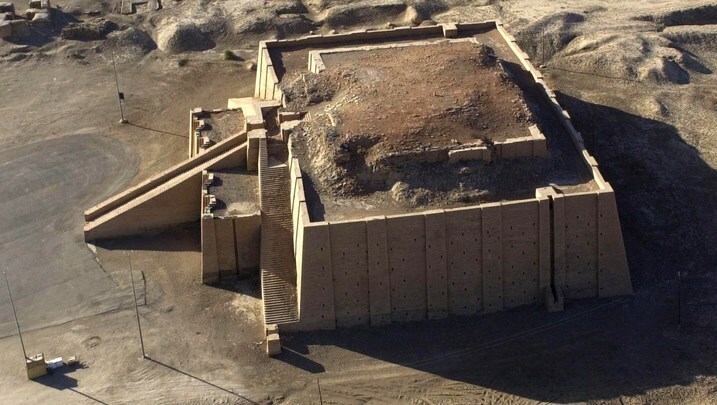 Most significant where the large pyramid like structures called ziggurats that they had built. These large multi-tiered structures were made from mud brick often were painted and had other types of smaller structures at the top. 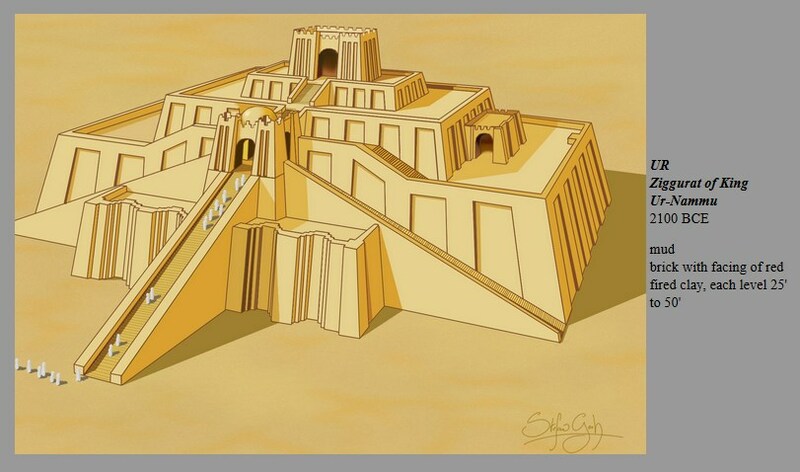 These large ziggurats were often located near burial grounds and the homes of royalty. Since these structures were located in a context close to the river as well as close to the aristocratic housing and religious structures, it is safe to assume that they were in featured areas with good resources and were very defensible. The height size and shape of these buildings indicates that they were monuments and were used for honorific purposes. Almost as if they were platforms to take the worshippers closer to the sky. Similar types of ziggurats exist in Egypt which are called pyramids but they are made out of stone. These ziggurats were made from mud brick. Found in and around the area of the ziggurats in many of the sites that we are studying where artifacts such as figurines, musical instruments, jewelry, and other types of goods those were all luxury goods. 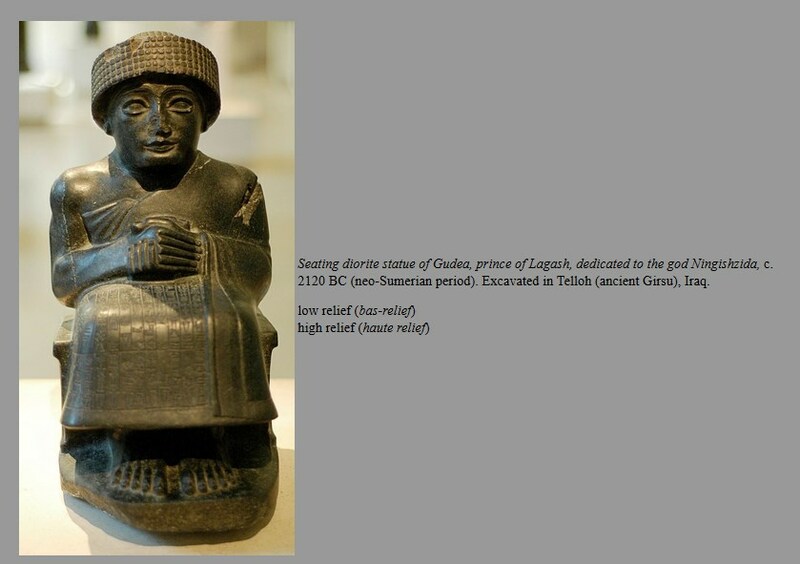 One of the sites a place called Lagash yielded many sculptures of a king named Gudea. Many of the figures that were found in the sites in Mesopotamia were made out of different kinds of stone and composites of clay and other materials. This sculpture is carved from stone called diorite. It has a combination all types of carving from low relief to high relief carving. Low relief carving indicates that there is not a lot of depth to the carving. For example low relief elements in this are elements such as the small beads on the hat the figure is wearing, as well as the cuneiform text carved into his skirt. Overall the whole sculpture is high relief because it is a complete in the round sculpture of a human seated figure. Although this is a depiction of a seated human figure with clasped hands it is also very stylized and in some ways distorted. For example the eyes and the facial features on this figure are exaggerated. The eyes are too large the eyebrows meet along the ridge of the nose in a sort of unnatural geometric stylization of human features. The anatomy of this figure is somewhat disproportionate, although, the artist clearly was attempting to form arms that looks very muscular. This figure represents a monarch. The interpretation of this figure is pretty much fact based on the fact that we have so much writing and also representation of important kings. The iconography of power includes that the king is represented as muscular. Notice his arms. He is wearing some sort of headdress which is honorific and almost could be thought of as a crown and his hands are clasped in a ritual type of form that looks prayerful. We see this and other sculptures as well. The indication of this is that this is a pious powerful king. However the stylization of the facial features is a standard across most representations of the human figure across Mesopotamia. Theories concerning the analysis of the facial features seem to indicate that larger eyes were preferred and this is a sort of idealization possibly indicating that the person had large eyes that could see more? It also may relate to a sort of feeling that eyes are the seat of the soul. However this is pretty much conjecture we have no documents that indicate why the exaggerated the size of the eyes and why the forehead was ridged with the eyebrows terminating into the ridge of the nose. 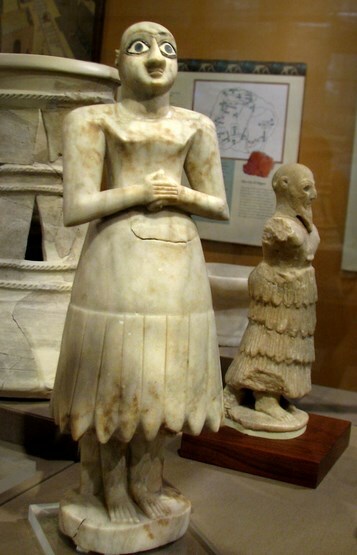 The clothing the figure is wearing indicates priestly class and we also know that in several regions of Mesopotamia as well as he chipped a starch type of kilt or skirt was worn by important people. In some representations of this same king he also has a map of the city on his lap. Some historians have interpreted this to mean that he is sort of the master architect of the culture he comes from. Found in the rural districts of a Mesopotamian city this sculpture is actually not as important a depiction of an important ruler as it is a stereotypical depiction of important people in Mesopotamian society. 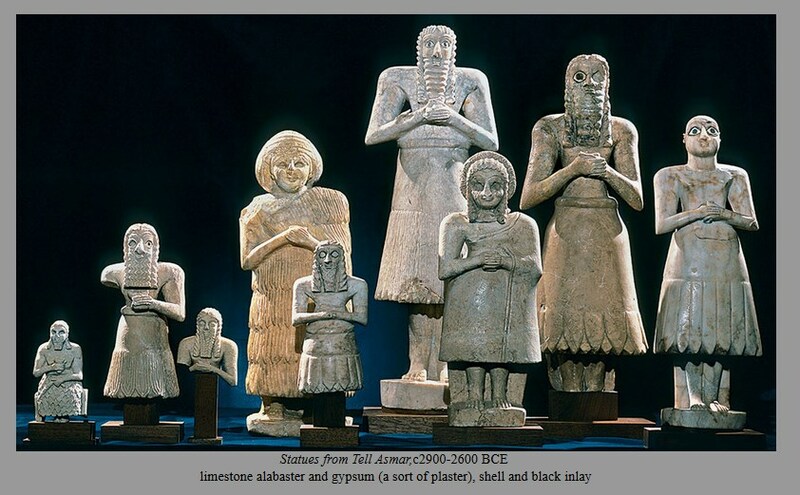 Other sculptures found in religious sites such as these ones from tell Asmar are probably representations of important donors or aristocrats in the culture. These statues usually range in size from about 6 inches to about two and a half feet tall. They are made out of limestone, alabaster, and gypsum, which is a form of plaster. They are adorned with shell and some black type of stone inlay. The sculptures are made in a process that is considered both additive and subtractive. 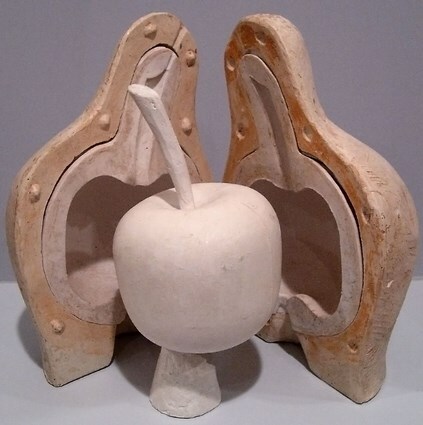 This is because the additive process would be using the plaster like substance to add form and often the alabaster and the gypsum are both carved in the subtraction of some of the substances used to make them. These sculptures are anthropomorphic which means that they are human formed. However, the sculptures are stylized as well. The terms stylized, refers to a distortion of something that is natural. For example, the eyes and the sculpture are stylized because they are made to large. The choice to make them large adheres to a kind of style that is shared throughout Mesopotamia. Other stylizations, such as the clasped hands, the muscular bodies, the way the eyebrows terminate in the ridge of the nose, are consistent with all of the Mesopotamian art we are looking at. 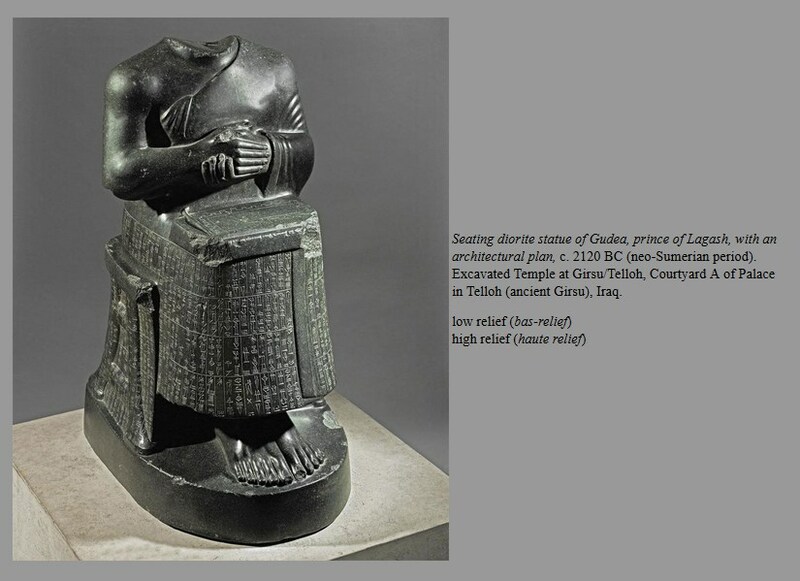 Later on will address why the stylizations occur, but you could probably already guessed by looking back at the section about the sculpture of Gudea. Much of the interpretation of the sculptures is based in factual data. Some of the sculptures had inscriptions on them and all were found in fairly well documented religious/temple sites. Therefore, it is reasonable to interpret the sculptures as being a sort of stand in for a worshiper who could not make it to the temple. This in some ways is kind of like lighting a candle in some religious circumstances. For example, some cultures and some religions light what are called votive candles. In essence the candle is a representation of the person praying. The same is true about the sculptures from the site of Tell Asmar. These sculptures probably represent people who could not make it to the temple and in most instances they represent aristocratic people. If you care to do further research, there is a wealth of information about the types of skirts or garments that they are wearing and also about the beards and shaved heads. The stylization of these, the large eyes, could represent in some way the eyes being the seat of the soul. It also could just be a pleasant stylization as well as the stylization of the nose and the eyebrows. In the cases where there are beards and hair in the sculptures these are geometrically stylized and probably represent some sort of fashionable grooming but also represent a standard of beauty. The clasped hands represent a prayerful stance. The beard could be a representation of wisdom, this is the case in many cultures, and in many instances you’ll see kings with beards. The well-formed bodies also represent some sort of beauty or power. The shaved heads, are a trait often shared by the priestly class and the scribe classes. The statues were found with in documented temples. There is writing on the sculptures and dedications, as well as a wealth of information surrounding them from the archaeological site they came from. This suggests a highly stratified society the well-developed religion and political structure. This culture was also well-developed in terms of trade and the division of labor. In the early 1920s and archaeological dig which included Americans and the British arrived at the site of Ur and began an excavation. 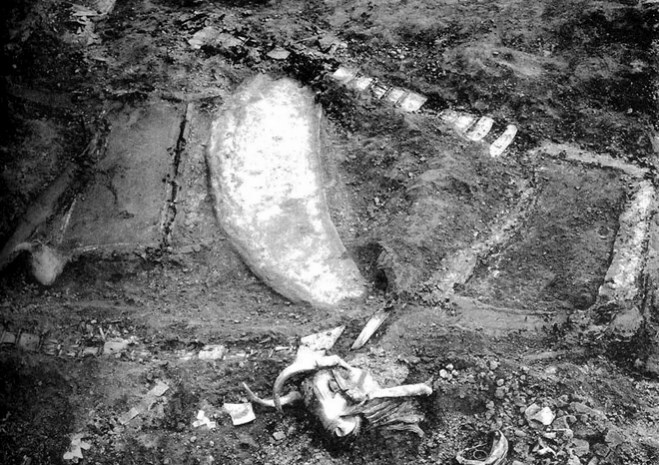 The leader of this excavation, a man named Sir Leonard Woolley, discovered a large burial pit that included over 600 people. 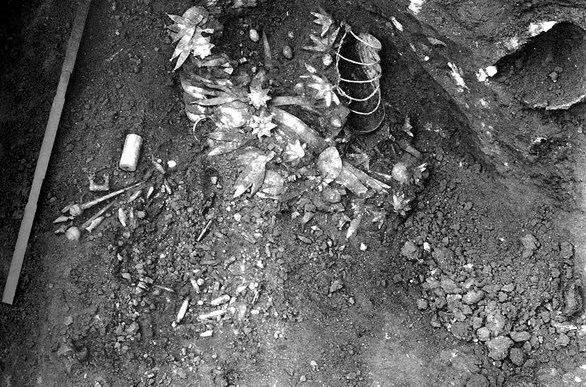 He dubbed the pit the so-called “death pit”. In it, or arrange of artifacts that were identifiable and dedicated to certain individuals. 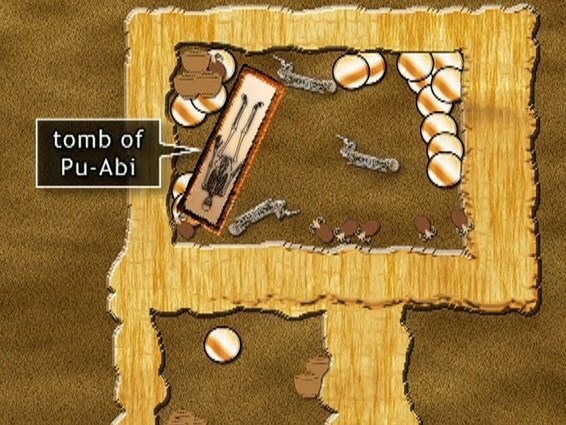 Lady Puabi and King Abargi were both found in this site although the tomb had been plundered at one point. Further forensic and archaeological evidence suggested to Woolley, that the site was used to inter a king and queen, and their entourage, and the presence of cups located near the lips of some of the entourage suggested to Sir Leonard Woolley that some had willingly drunk poison to join their king and queen in the afterlife. The so-called “Standard of Ur,” is approximately 2 feet long and probably 6 inches thick. It seems to be hollow, and is inlaid with wood shells and stone. All sides of the box are decorated with long registers containing human figures and animal figures. The size and proportions of the figures varies. Some figures are quite large in comparison to the others. The costumes also very on each side. On one side, are various livestock and wagons being led in a procession by shaved headed men in various styles of skirts or kilts. On the other side, is a procession of figures wearing armor and driving chariots. Some of the chariots seem to be driving over bodies. The stylization of the figures is consistent with the stylization of the other artifacts we have studied. The ridges of the eyebrows seem to terminate in the nose and the eyes are represented as being slightly too large. The bodies are fairly naturalistic and seem to be athletic looking. There is no variation in terms of thick or thin of the body types. All seem to share the same sort of thin athletic body. I’m going to synthesize iconography and context in this because it informs us of what the possible function of this box may be. Since it was found in a gravesite, in which a procession had been laid out, Sir Leonard Woolley and other archaeologists have surmised that this box is actually a type of standard or a wooden type of flag or plaque. One archaeologist suggested that it would’ve been mounted on a pole and carried. Below is a relief sculpture from Egypt around 3100 BCE. It represents a King and his entourage and in the top register (band) you can see some figures holding up what are referred to as standards. Sometimes these are boxes sometimes these are flags made out of some sort of textile. This is how the Standard of Ur must’ve been carried in the procession. The subject matter of the two sides is interpreted by historians should to be one side representing peace and one side representing war. The so-called peaceful side, is divided into three frets or bands sometimes referred to as registers and in each band it seems to represent a procession of people and livestock. The clothing they wear or kilts represent the regions they are from. The shaved head and shirtless torso seems to be a standard style in Mesopotamia. The two bottom levels progress from left to right, however, the top level seems to have a procession that progresses right to left. On the very top level there is an instance of a size scale difference that is referred to as hieratic scale. Hieratic scale is when you represent one figure larger than the rest of the figures to show that that person is more important than the others. Therefore the figure on the far left is probably a ruler or a King, or a priest. The fact that he presides over a group of seated figures who are drinking wine and followed by musician holding a harp seems to add credit to this interpretation. The livestock, the music, the arrangement of the procession, and the hieratic scale all make it seem reasonable to believe that this side of the standard represents a celebration or some sort of peaceful parade or activity. The reverse side of the standard, shows with seems to be a military force. On the bottommost register are a series of soldiers in chariots wearing helmets carrying spears and riding over human bodies with their horses. The top registers and middle register seem to represent soldiers in a procession with prisoners. 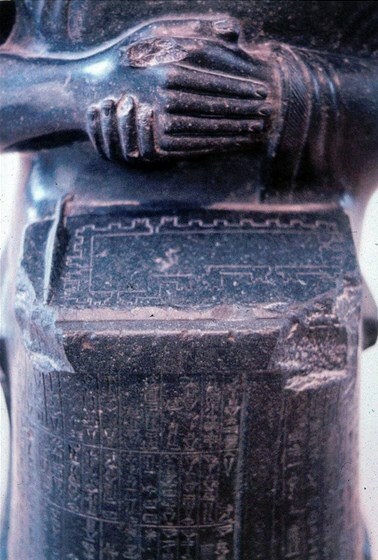 At the very top center of the topmost register is a figure in hieratic scale and is wearing a helmet. This represents either a military leader or a King. Later analysis of the symbols and the juxtaposition of the symbols in this work of art have led some historians and theoreticians such as Sir Edmund Leach to reach a conclusion about how human beings think on a larger level. Edmund Leach was a structuralist anthropologist to suggest that we divide our experience into good and bad. He kind of refers to this as a structuralist or binary approach. One of the best ways to think of this is to think of a negative and a positive representation of life. Or the things that is necessary for King to do. His conclusion, regarding pieces like this is that by showing war and a relatively peaceful time it might be demonstrating the two sides of being a ruler or having a stable kingdom. The fact that this was found in a tomb that was dedicated to a king and queen tends to support that this was a Royal object that might have been a kind of communication to the King in the subjects of the power and activities of a strong kingdom. 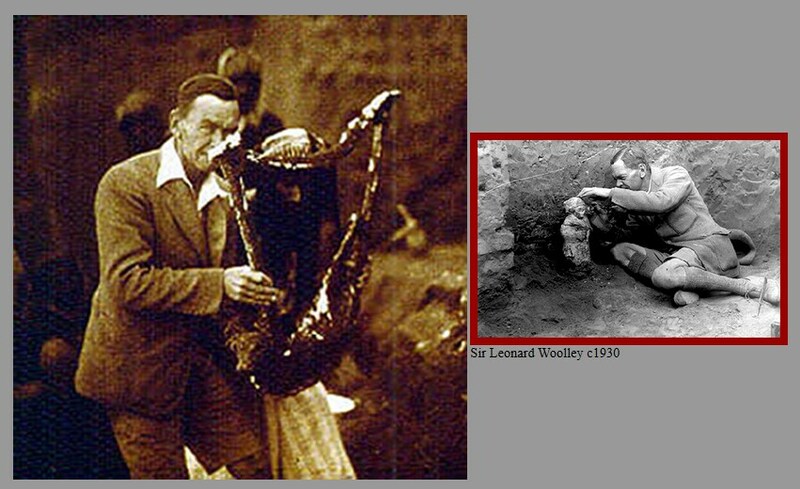 This is what Sir Leonard Woolley found in the Queen’s tomb. Found in the tomb were some of the regalia as well as musical instruments that would’ve been associated with aristocracy. The Queen’s crown was found in this tomb and is a good symbol of some of the desired characteristics and pleasurable things also associated or wished for by the aristocracy. Precious metals such as gold since they are rare are often associated with wealth and aristocracy. Working metal into thin flexible sheets and attaching them to a headdress is also a way of making the precious metal more valuable. A precious substance such as gold, silver, or even stone, becomes more valuable when it is shaped skillfully. The forms that gold is hammered into directly apply to what the jewelry or regalia represents something about the Queen. For example, flowers, reeds, and other types of organic or vegetal motifs could be associated with fertility and with growth as well as peace. 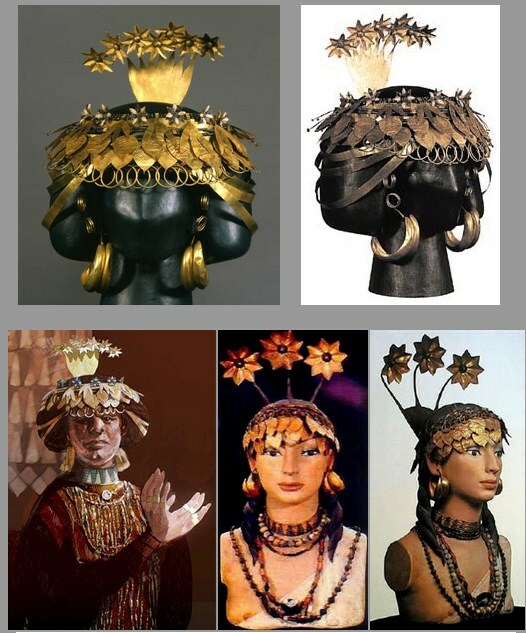 The fact that this headdress was interred with the Queens remains never to be used again by another person indicates possibly a type of sacrifice on the part of the subjects showing respect to their Queen. The same can be said about the liar or harp that was found in Queen Puabi’s tomb. This is a photograph of the harp in situ. The term in situ means in situation. So when you hear or read the term in situ it means where it was found originally or in it’s a literal original location. One of the best ways to analyze an artifact is to place it in its context. In this instance, is a detail of the harp player from the standard found in the tomb. 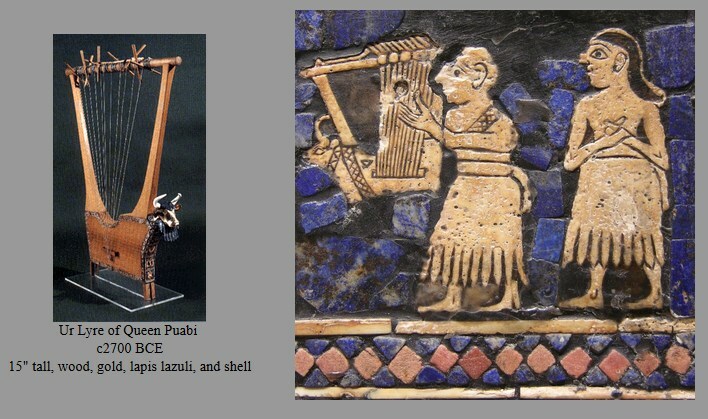 This inlay stone decoration, a type of Mosaic, on the right, represents a musician playing a harp that looks very much like the harp that was found in Queen Puabi’s tomb. This tells us two things, how to reconstruct the harp and how it looked when it was played. It also tells us, since it’s placed in the context of a ceremony or celebration that music was used for religious and aristocratic celebrations. We can further extrapolate, that music might’ve been an integral part to the Mesopotamian world. The harp is about 15 inches tall and is embellished with inlays of lapis lazuli, shall, wood, and gold. All substances used to make this harp are considered rare elements. This will tie into an iconographic analysis. The decorations on the harp and on the sound board include compound creatures made of human and animal, anamorphic, anthropomorphic, and scenes that include weapons, musical instruments, and possibly even stories. On the right-hand side of the image above is the soundboard that was created out of inlaid precious stones that were cut carefully and join together with glue onto the wood body of the harp. 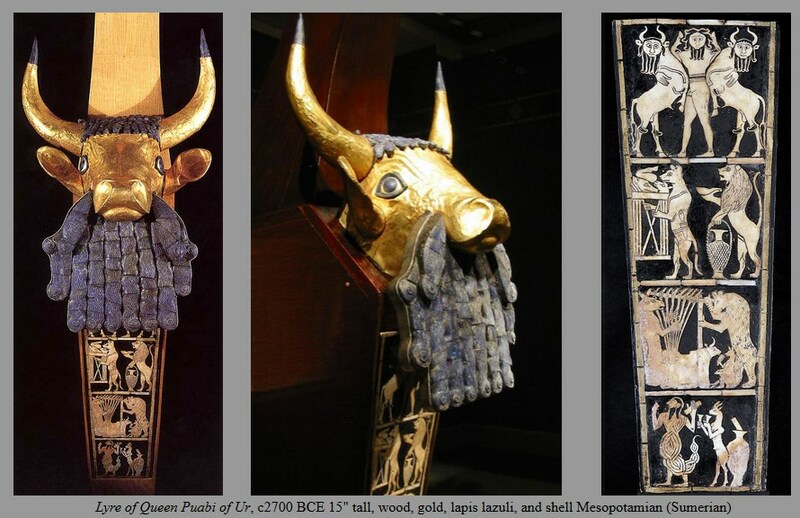 It’s possible to extrapolate from Stone Age art and also from the site of Catal Huyuk that symbol of the bull could mean something similar in all three instances. Most likely the bull represent some sort of power and is also a prestige item. Controlling a bull, is something that is difficult to do and would also express the athletic prowess of an individual able to do this. This will tie in somewhat with a piece of literature from Mesopotamia called the epic of Gilgamesh. 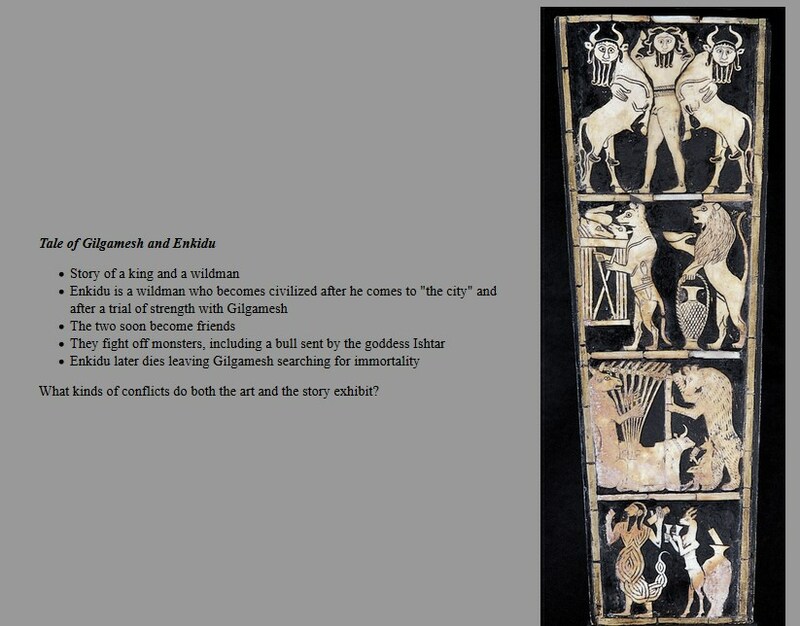 In the epic of Gilgamesh, which was written in cuneiform, and exists in several forms and translations, there is a basic plot element in which a King named Gilgamesh wrestles with the wild man named Enkidu. (This is not necessarily depicted here it is possible that it is the same story or a different one in which a human wrestles with some sort of animal.) In another instance in the story, Gilgamesh fights it’s called the bull of heaven called Humbaba because he offended a goddess. Gilgamesh is a legendary King who in his epic is able to civilize a so-called wild man and visit the underworld, fight supernatural animalistic forces, as well as learned compassion for other human beings. The epic battle by a human against a bull like creature, think about the ancient Greek story of the Minotaur, who was half bull and half man, could show the power and strength of a leader. Leading us to surmise or theorize at least those representations of animals and humans on this soundboard could represent a story similar to the epic of Gilgamesh. 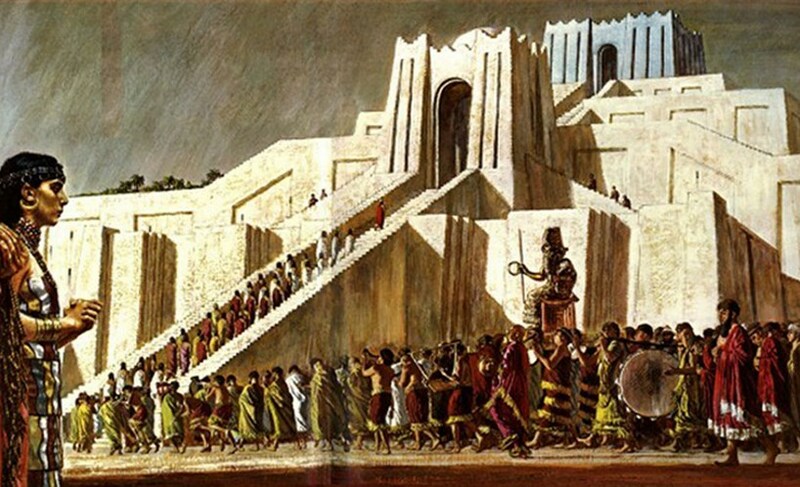 The ideas of order and disorder, civilization versus uncivilized, seem to be common symbolic themes in Mesopotamian art as well as other civilizations. The previous sections were designed to give you a feeling of context and chronological continuity. 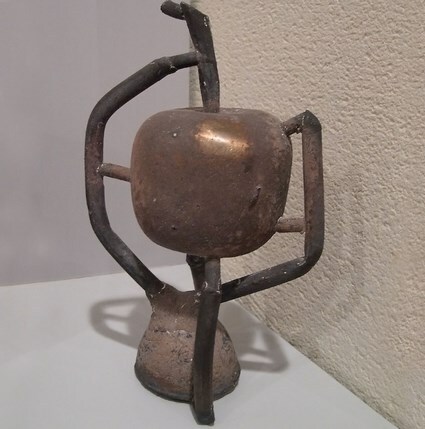 We began with around 3000 BCE and looked at some sculptures from Tell Asmar and the ziggurats. 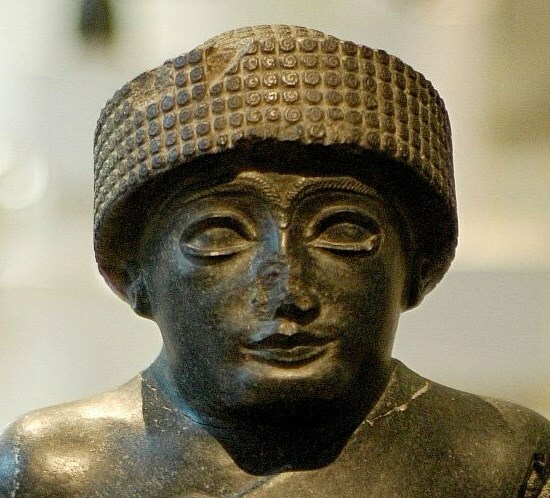 We’ve already mentioned King Gudea, who although there are a lot of representations of him was not a particularly notable ruler. In this next section we are going to be moving chronologically and use a series of Kings and representations of the Kings as a way to give you a set of artifacts that are placed in a definite sequence of time that represent different Kings periods. This next work, was found far away from the site of the city of Akkad, however, most of the texts indicate that they believe that it originated in the Mesopotamian city of Akkad and was removed from their and defaced as an act of war. In this next section, we will cover three major rulers in chronological order and artifacts that are associated with them. Please keep in mind, that we are building on your knowledge of iconography, so this means if you don’t understand what the symbols mean in the previous section go back and review them because they will apply directly to interpretations of these three Kings. This next section, is also useful for Western civilization classes because it kind of describes the evolution of power in the ancient world. 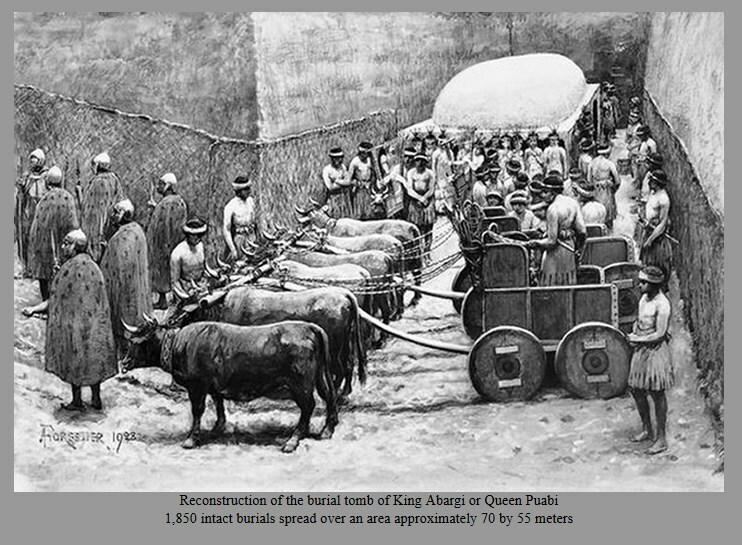 Sargon as a ruler is probably the result of food shortages brought on by poor irrigation practices and the fact that the greens cannot tolerate saltwater which was present in the overflow from the Tigris and Euphrates rivers. Kings and warlords probably challenged the already established cities, this King Sargon came from very modest circumstances in a town that was probably nothing more than a bunch of tents and mud structures in a marshy land. 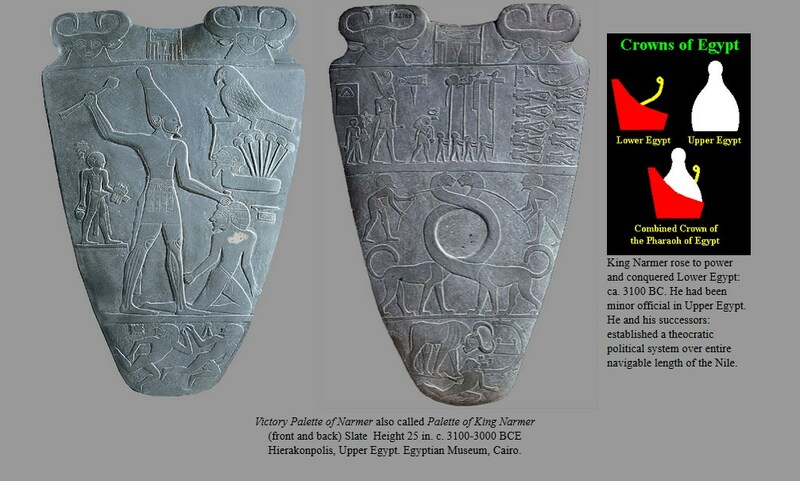 The histories inscribed about him describe him as one of the previous king’s aids or helpers. Sargon was known as the cupbearer of Kish. Some sources attribute his success to fighting from high ground and other military tactics. There linguistic kinds of things that go along with his naming. Since he was worried about being not a legitimate ruler because he overthrew the former king he incorporates his legitimacy into his title. This is a common practice by most Mesopotamian kings to announce their link with heaven through some sort of title. In essence’s Sargon renamed himself so that he could justify taking the kingdom and say that his rule was approved of by the heavens. Probably the first way that a person can prove that there legitimate or important is to make themselves look good. In this formal analysis, we’ll see that this representation of Sargon is meant to make him look beautiful. The lost wax process is a process that is still being used today. There are several different ways this process is done. 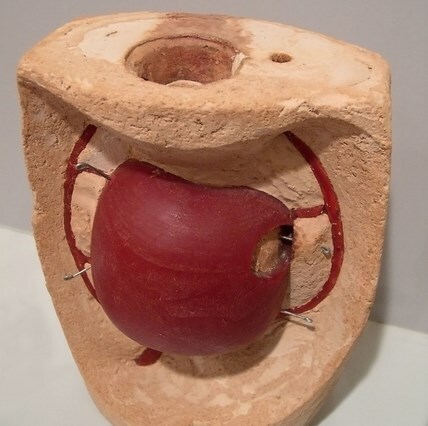 One way is you make a wax sculpture in case it in clay or plaster and then heated up so that the wax runs out. 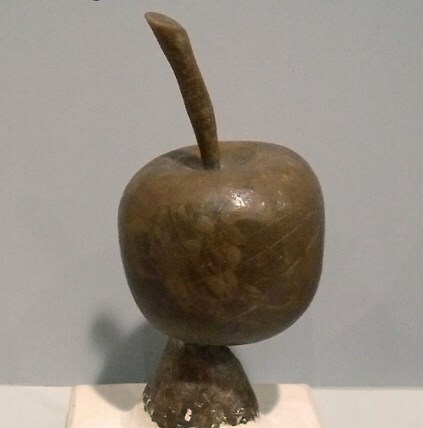 There’s a cavity left inside the plaster and you refill that with molten bronze or some other type of metal. Here are some diagrams and explanations of how this process works. This process is really important for you to know and it will be talked about the rest of the semester. 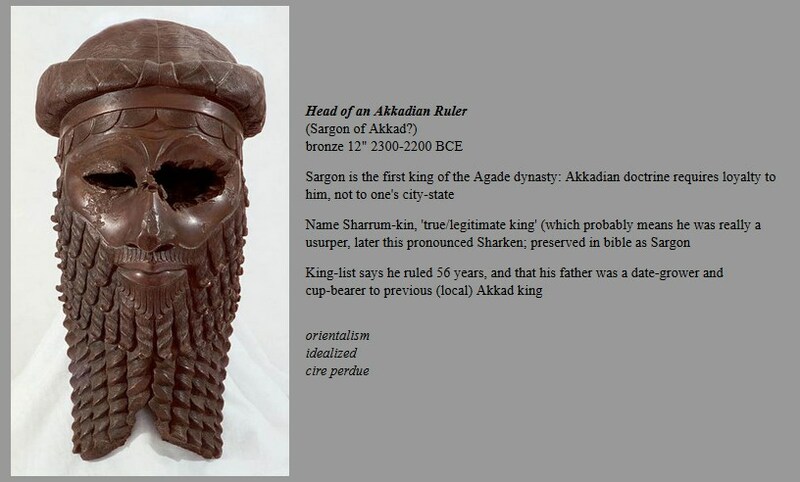 Sargon is also handsome, even though he’s missing his eyes and ears due to vandals who didn’t like him, he still is a very attractive and symmetrical looking person. The sculpture is stylized in the typical way that the Mesopotamians enjoyed. 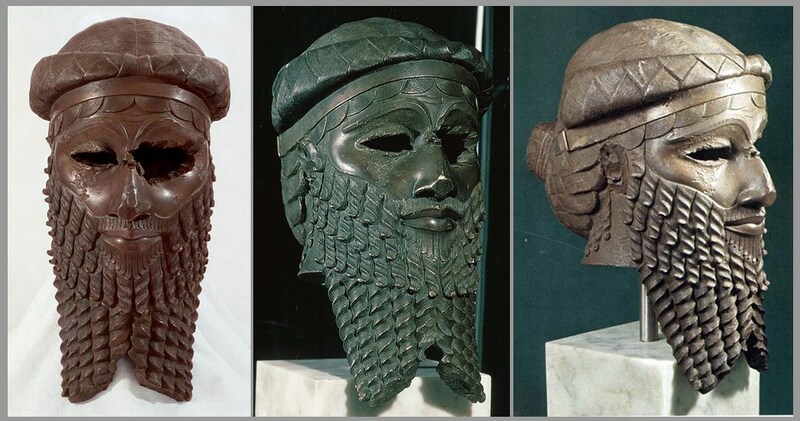 For example, if you compare Sargon’s beard to the statues that we found at Tell Asmar, you’ll notice that they share the same over large eyes, sweeping browse and arcing nose. The hair or beards when portrayed in both of these are geometrically stylized. This means that the beard and the ringlets of hair are made to look regular and based on geometric forms. In the sculpture of Sargon on it’s not as rough as the earlier votive figures. This may not have as much to do with the evolution or time in between the pieces, the voted figures are from 3000 and this one is from about 22,000 BCE, it’s probably because the voted figures were made by artists who weren’t as skilled and didn’t have the same supplies. Sargon on sculpture is made in the lost wax process which is a highly refined process and an artist to is pretty accomplished would be an artist would have access to this process. The fact that the sculpture has been defaced, the ears and eyes have been taken off, is probably due to the fact that was carried off during war or the result of vandalism. This means that the King who’s effigy it is was no longer in power. Even though this wasn’t the intention of the artist it can be part of the symbolism. We know how this King might’ve been thought of after his death. The fact that the King is portrayed in a very high a stylized manner, and is even by our own standards a handsome or attractive face is a kind of propaganda. In our own cultures we rarely see a work of art or a photograph of a president that hasn’t been airbrushed in some way or altered to make him look more handsome. This is probably the case with this representation of Sargon. He is also wearing a type of regalia or headdress which could be a symbol of aristocracy. The use of beards to portray philosophers and ancient Greece as well as Kings in our own culture is often conflated or combined with the idea of wisdom or knowledge. This portrait probably represents the King Sargon because of the dating of it, the context in which it was found, but also because it is a propagandized vision of what a handsome King should look like from the Mesopotamian world. In fact the defacement of this sculpture might even lend more credibility to this interpretation. Keep in mind this is all theory. 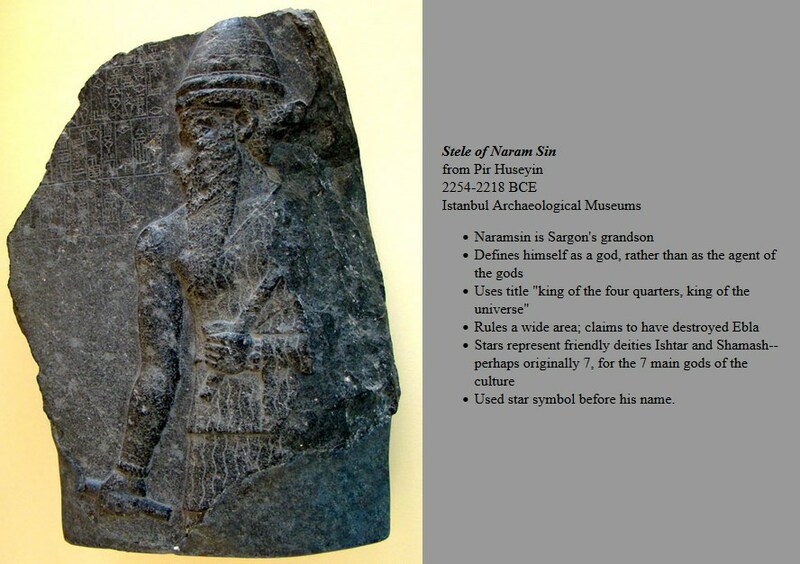 Probably the most important or remarkable thing about stunning King Naram Sin is that he’s another King like Sargon, who changed his name to legitimize his rule or at least to amplify how powerful he thought he was. Notice that he gives himself several titles that equate him with something heavenly such as stars. The cuneiform text just up to the left of his head has a little starburst pattern and it and that’s actually a sort of surname or title placed before his name. So in both the cases of these Kings what they do is they come up with a sort of new name that’s written down in cuneiform that associates them with some sort of heavenly or legitimized rule. Notice however that this King is only probably the King because he was the grandson of an earlier ruler. Just like his grandfather this representation of King Naram Sin represents him as muscular, with a beard, some sort of headdress, and in this instance he’s also carrying to staffs. He’s also wearing a little bit of jewelry. These symbols, for example a King’s scepter, and the wise old beard and crown as well as his muscular body all represent a physically powerful well equipped king. When you combine this with how he spells his name it’s definitely a sort of advertisement he is. In this next work of art the context and the iconography of the previous work of art are amplified. Monuments are not always created voluntarily by the subjects of rulers whose acts they commemorate. Perhaps this is the case with this next relief carving. This was not found where it was made originally. 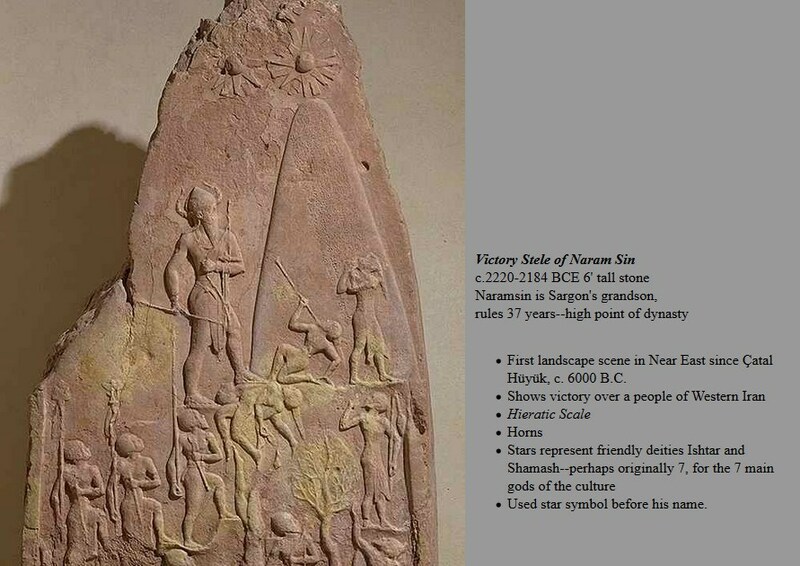 In the 12th century BCE long after King Naram Sin’s reign another Elamite King carried off this stele as plunder or treasure in a war. There are two inscriptions on this sculpture one is made by the King who stole it and another inscription that explains its original purpose and what battle it commemorated. 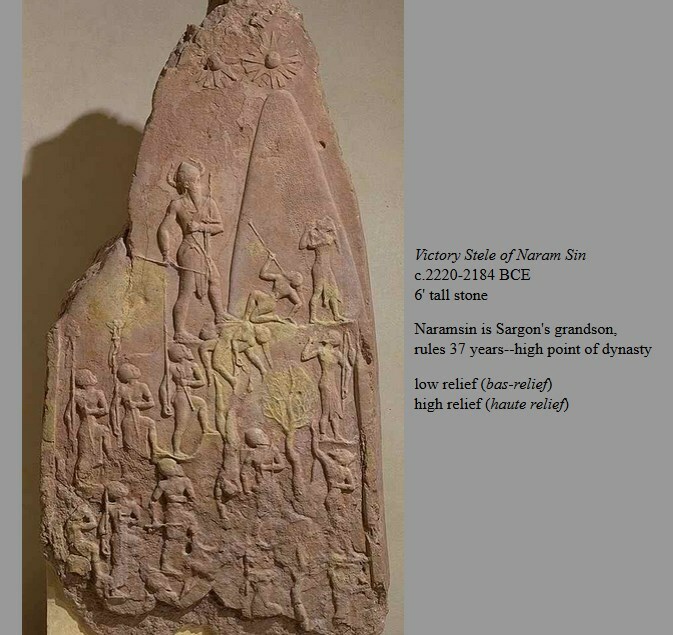 The original inscription indicates that it was created to commemorate a victory by King Naram Sin over the people of Lullibi at the base of the Zagros Mountains. We already know from the inscription what this plaque or stelae represents. 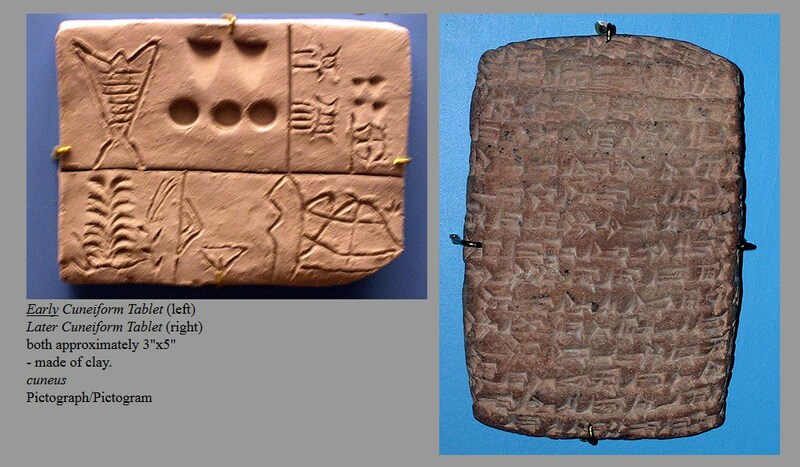 The cuneiform text is clear to us. We know it’s a picture of a King who was victorious climbing a mountain. There other symbols that is specific to the Mesopotamian world that would amplify the meaning of this. The first probably most important set of symbols is about the King himself. He is represented in hieratic scale. He’s larger than life size compared to the other figures. He carries some things on him and is stressed with some things that indicate his power. He’s got a bow and arrow as well as a headdress and the headdress is adorned with a symbol of power that we’ve encountered several times, the bull’s horns. His body is powerful and his arms are muscular. He also has a beard. The things that surround the King and the scale of things is also an indication of his power. He is almost on top of the mountain where the stars that represent the gods are. In fact is also the size of the mountain, and this probably means or equates his size and stature with the mountain. He’s also at the top of the picture meaning he is higher than everyone else. He tramples or is at least walking on the people that he has overpowered and you can tell each person is based on their beards and headdresses. The sorts of uniforms they wear are specific to the regions they come from and express who they are. You may have noticed that the way these figures look almost looks as if they are copied from the Egyptian culture. The poses of the bodies are the same in both ancient Egyptian and ancient Mesopotamian art which exists at the same time. Both cultures existed between around 3000 and ended somewhere around 1000 BCE. They actually knew each other and traded with each other. This is where a contextual analysis and an iconographic analysis kind of get combined. The pose that you see in Egyptian art as well is Mesopotamian is called a composite or compound view of the human body. A good description of it would start at the top. In a composite view the head almost always in profile. However, the I in this profile face looks like a full frontal eye. The torso is a frontal view. The legs are shown in a profile view. This is a convention of formal design but it also might have some sort of iconographic meaning. The composite view of the body is probably the most complete view of the human body that any style can come up with. You get to complete arms complete legs and at least one full frontal eye. This could also be not just the stylization but a way of making the effigy of a person or representation of a person as powerful in terms of magic religion as possible. I’m not sure that the Mesopotamians believed that their spirit could inhabit a sculpture. It’s quite the opposite for the ancient Egyptians, they actually believed that when one died your spirit could inhabit effigies or sculptures that represent you and you can continue to live in the sculptures as a spirit who dwelt them. This is probably not the case with the Mesopotamian culture but maybe something like that exists. If the sculpture represents a person and you wanted to kind of be invested a little bit with the spirit of the person you want to represented in is complete away as possible. In this victory stelae, many of the stylistic conventions of the previous works we’ve studied are evidenced. For example, the bodies are muscular, the costumes are very similar, many of them are in composite view of the human form, the eyes, the eyebrow, and the nose are all stylized in a similar way and it is a combination of high and low relief carving. The figures are carved in a higher relief, which means they project further out, than most of the elements. The elements that you would consider low relief are the incised letters, cuneiform script, and some of the details that describe the mountain and the clothing. King Hammurabi was considered to be a very good King by the Mesopotamians that he ruled. There’s a lot of art dedicated to Hammurabi, and this is probably because of the things that he created and the way he ruled. First of all, he’s known to be a very good King because at certain economic crisis times in his Empire he made rules that were literally tax breaks for his subjects. He forgave debt to the government by his subjects at three separate times in order to make the economy better for his people. Another important accomplishment for Hammurabi was that he created the so-called code of Hammurabi. This code has been recorded in cuneiform throughout Mesopotamia and we have a full copy of it in cuneiform on a large 7 foot tall stone stele. Context, the “Code of Hammurabi” and the “10 Commandments”. Judaism as a religion and as an ethical moral system evolved probably out of the region known as the Fertile Crescent. The Bible or as the Jewish people call it the Torah or Pentateuch is first discovered around 1000 BCE where the code of Hammurabi dates from about 700 to 800 years earlier. My theory is that the code of Hammurabi is the basic document on which much of the Egyptian and Jewish religion and laws were based on. Primarily, the code of Hammurabi has hundreds of laws that deal with property, ethics, crime, and punishment. It is interesting to note that one of the major accomplishments that Hammurabi was celebrated for was economic rather than military. This relief sculpture, called the stela, has both a high relief carving at the very top of it and a text which is inscribed cuneiform beneath it. The interaction or relationship of texts, (both images and writing) creates even more meaning for us to understand the iconography. In essence this sculpture represents a ruler and his laws. The interesting part of this is how the artist created an image above the writing that expands and supports the text beneath it. 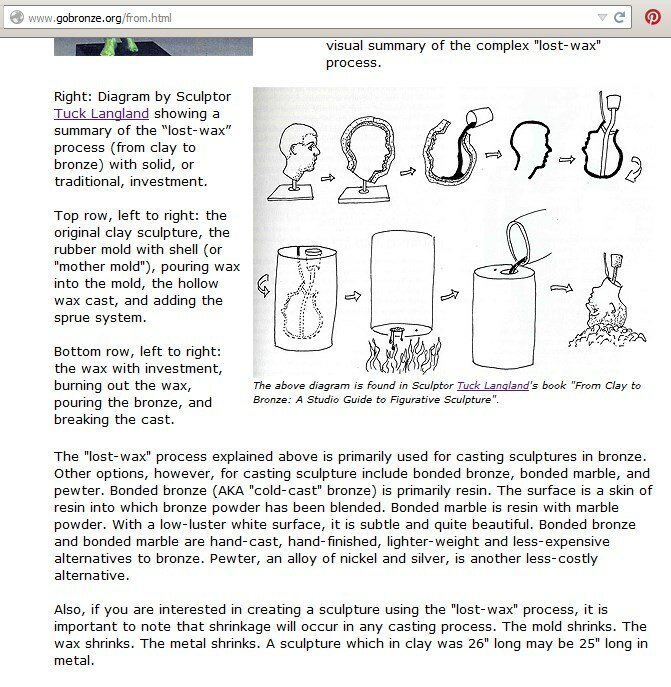 Even the images at the top of the picture or the sculpture and somehow comes before the text that runs underneath it. 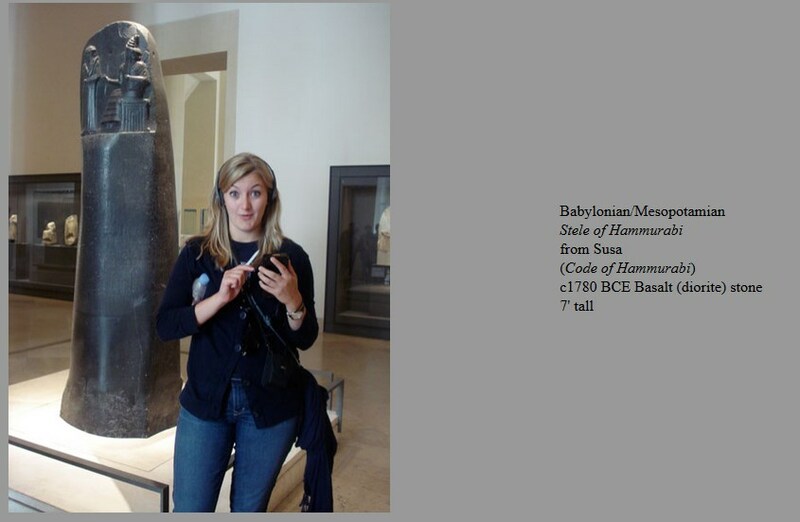 Overall the basic idea behind this sculpture is to ratify or solidify Hammurabi’s authority. 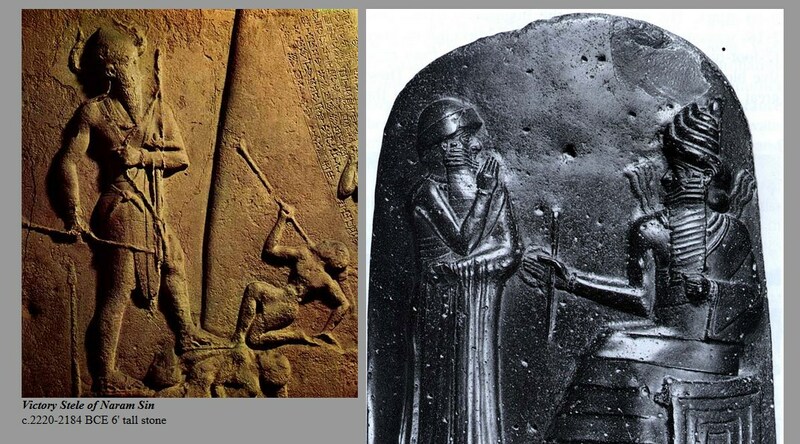 The overall scene represents the seated God Schamash should who is handing the standing Hammurabi a scepter. The scepter probably represents authority, law, and rule. The identity of each character as well as their role is represented through the clothing they wear and how they are represented. The God is represented with “hieratic scale” he’s larger than Hammurabi. 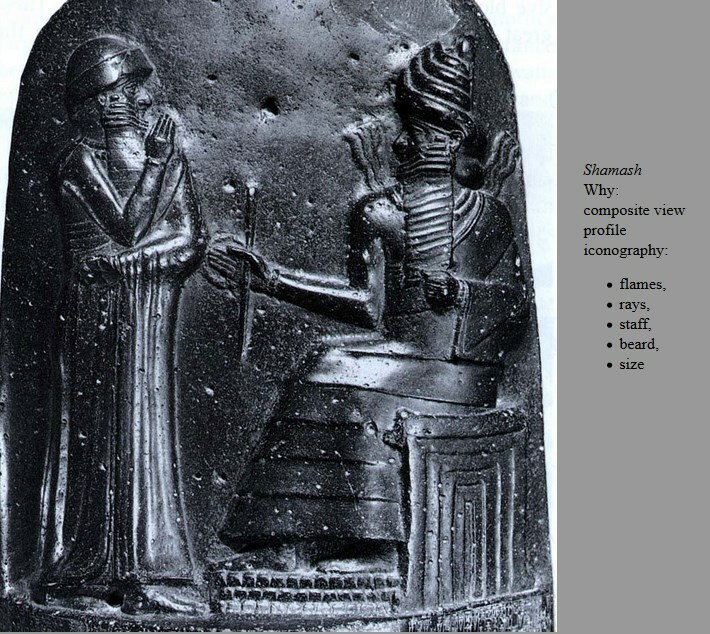 Hammurabi is half the size of Shamash and this is represented by the fact that although Shamash is seated (probably on a throne of authority) and even though seated he is almost as tall as Hammurabi. (Shamash needs the crown he wears to complete the illusion of height.) Shamash, like Hammurabi has a beard (wisdom and age) and is wreathed by two sets off waves from his shoulders that may represent flames or waves of light. (A type of Mesopotamian halo.) If this is a halo or aura of light it seems like another symbol of power. In many religions, Islam, Judaism and Christianity often employ a halo or aura of light to represent “enlightenment” or spiritual consciousness. Both are represented in composite pose (a stylistic convention or possibly symbolic of completeness?) and both have well-muscled arms (strength? ).